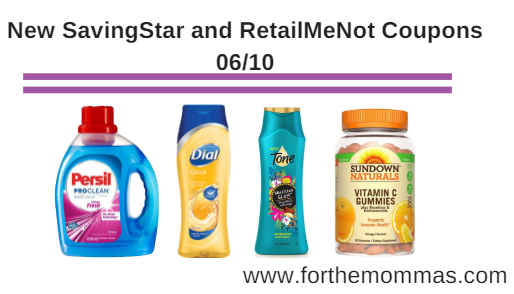 Today there is 2 NEW RetailMeNot (formerly Redplum) coupons and 3 New SavingStar Coupons available to help you save on brands like Dial, Persil,Tone and Sundown Naturals. Save $2.00 on any ONE (1) Persil® ProClean® product. (Excludes 6 Loads or Less Trial/Travel Sizes. ).Expires 7/7/2018.Save $2.00. Save $2.00 off TWO (2) Dial® or Tone® Body Wash or Bar Soap (6-BAR OR LARGER).Expires 7/1/2018.Save $2.00. Save $1.00 off TWO (2) Dial® Complete® 2-In-1 Bar Soap, Foaming Hand Wash, Hand Soap Refills, Bar Soap (3-BAR OR LARGER).Expires 7/1/2018.Save $1.00.